On our recent trip to Kununurra on the Western Australia/Northern Territory border we camped right next to the Hidden Valley National Park, because you are not allowed to camp in the park itself. There were walk trails into the park from the camping area and although the park is not particularly large it is very spectacular. 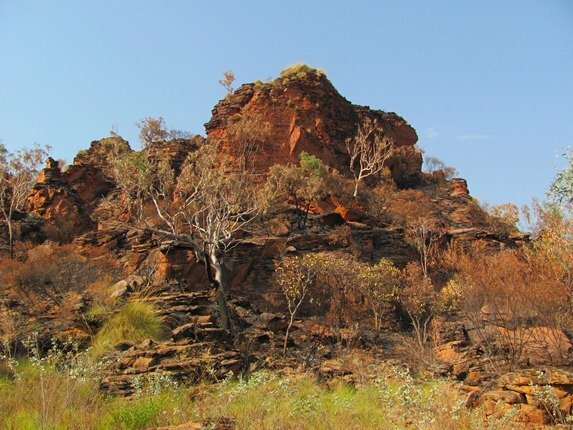 There had been bad fires throughout the Kimberley and access to many areas was restricted and the famous Bungle Bungles National Park was closed due to fires. 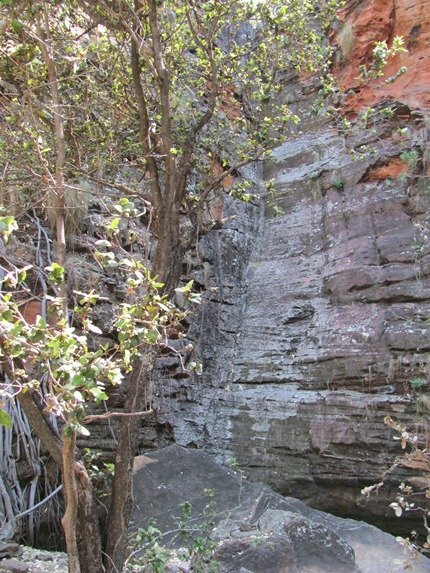 This park in Kununurra is like a very miniature Bungle Bungles and we had hoped to find two specific birds in the park. However, a week before we got there there was an arson attack and most of the park was burnt. There had been a similar event in September 2008 and it had recovered well. 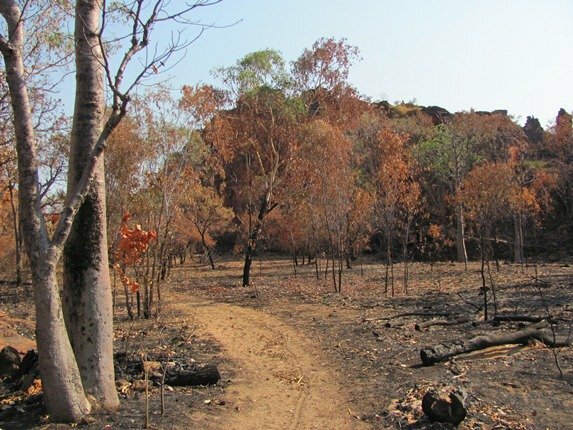 Fire plays a large part in the Australian bush and although only a week had gone by there was new growth and the park was slowly recovering. 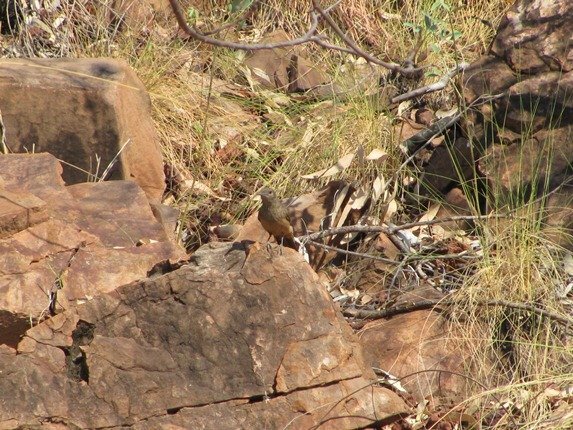 Although it initially looks like you would be unlikely to see any birds in the park there were pockets of unburnt trees and we encountered numerous species. Any trees that had any green growth left on them were attracting the birds. There are several short trails in the park and you can drive into the park if you are not camping in the campground right beside it. 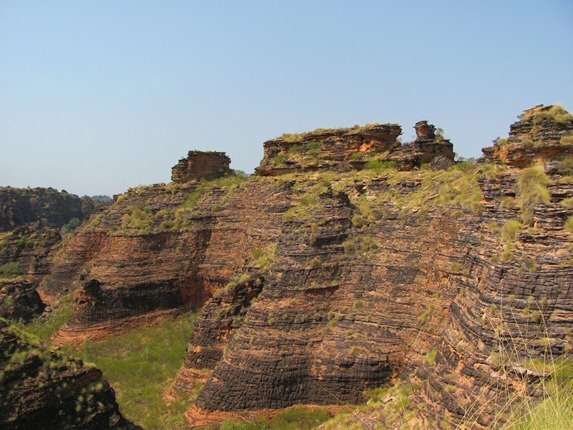 One trail takes you to a lookout and offers spectacular views through the park and over the town of Kununurra. A new walkway has recently been erected and thankfully did not sustain damage from the fires. 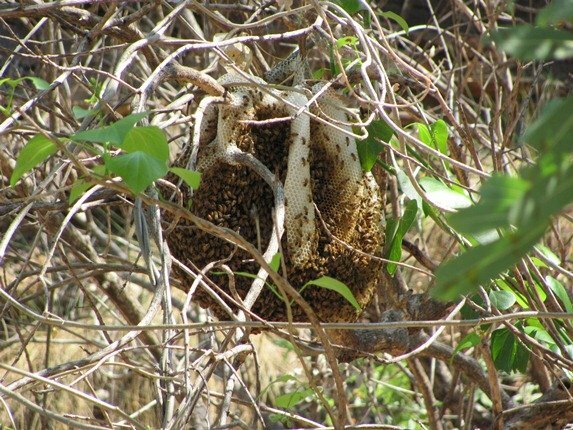 It is designed for wheelchairs and strollers to enable more people to enjoy the park and as we went along it we noticed this magnificent hive. As we came around the walkway we heard a sound we had hoped to hear. There’s nothing like the sound of a pigeon in flight, especially if it is a pigeon you are looking for. Of course you then hope that there is more than one! Thankfully we saw the bird in question in flight and it landed on a ledge on the side of the cliff. 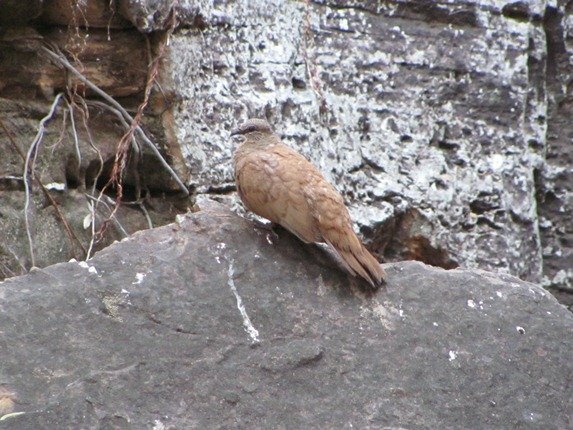 We were thrilled to see that its mate had remained on a rock close to the walkway. 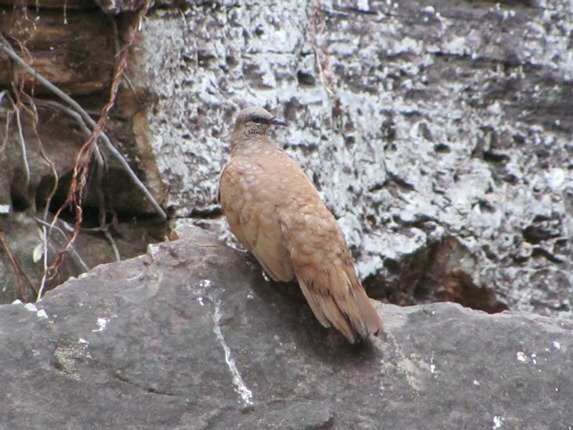 This was a species we were hoping for in the park-a White-quilled Rock-Pigeon! This pair of birds were at the base of what would be a waterfall during any rain event and there were literally hundreds of butterflies on the walls of the cliffs. 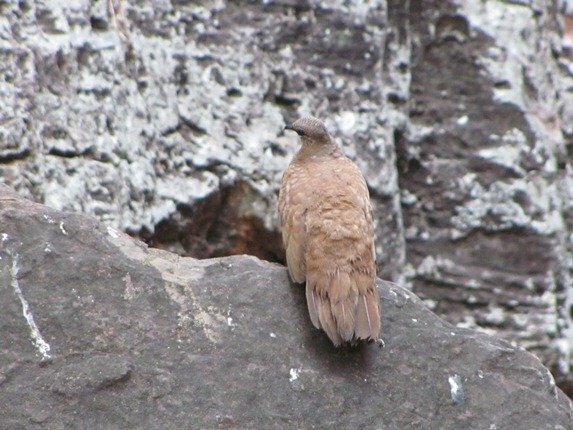 The second bird flew and we investigated closer to the base of the cliff. As we suspected, there was a small amount of water still present and it was attracting both birds and butterflies. It did not look particularly inviting, but was enough to sustain the animals and birds in the park until the next rain. We continued through the park and heard another sound that we had hoped to hear. You can’t beat this sort of landscape for a bird that is throwing its voice around the cliff walls and making the most of echoes. You are searching where you believe it is, knowing full well that it is extremely well camouflaged and you just wait for it to move. 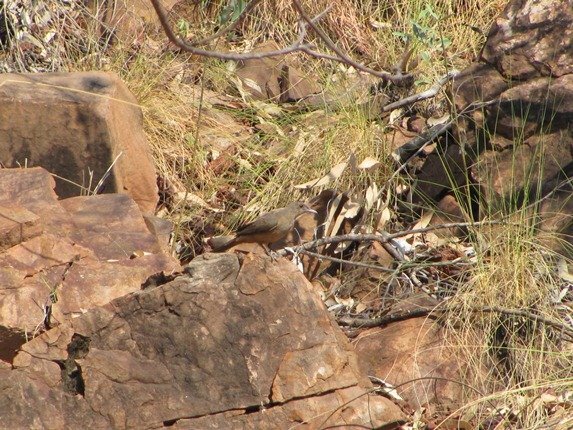 We finally got our eyes onto the other species that we had hoped for in the park-Sandstone Shrike-thrush! It was high up on the cliff wall and calling continuously, so we wandered on hopeful of another. It didn’t take long and we found a second and a third bird. They were busy checking under the rocky outcrops for any spiders or other insects that had survived the recent fires. As you can see, they are well camouflaged. 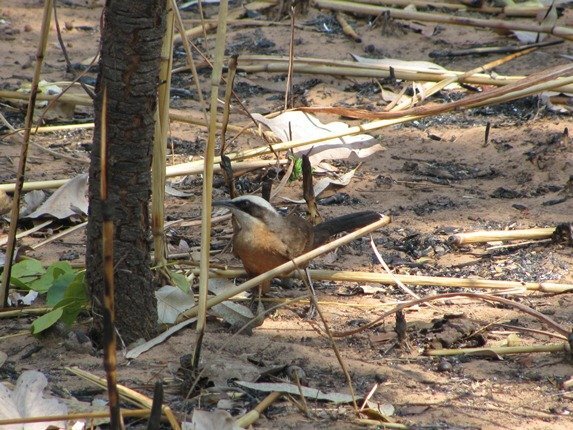 Along the trail there was a family of Grey-crowned Babblers and they were busy flicking over all the burnt leaf matter looking for food. Although it may look initially like a more than ideal birding area after such severe fires you should never let that deter you. 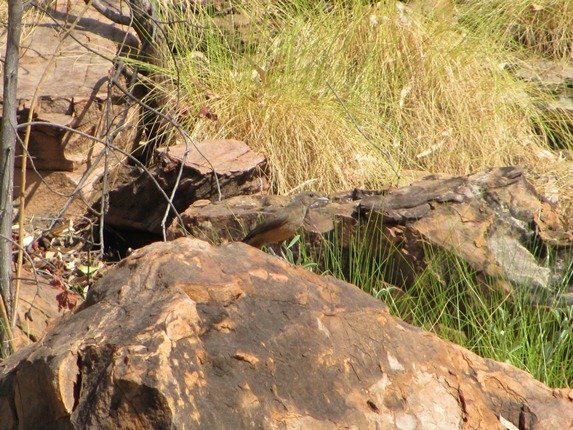 You may well find the two species that you hope to see in the Kununurra area and add them to your year list! I loved reading of your adventure and seeing the two birds you sought, as well as the magnificent geological formations. It sounds magical to be there hearing birdsong, seeing masses of butterflies, and seeing that the land is recovering so quickly from the fires. Great post! @ Mike…we like that we “live in a whole other birdbook”!! Thanks. Love the birds & landscape! Had to be cancelled due to some devilish thing called “tax declaration while your toddler son is sick”. But I’ll have something soon.